Expand your Wildcat network. Maybe you’re looking for a mentor or seeking advice from industry leaders and those who have been there before. Find it all in this new online community exclusive to Wildcats. Register on beardownnetwork.com to access an alumni directory and industry groups to make UA connections in your city and industry. Plus, elevate your career with mentorship opportunities, professional resources and an alumni job board. Wildcats Connect are in-person networking events across the nation! Spend an evening connecting with local Wildcat alumni and company recruiters. Go to the Alumni Association calendar for more information on networking events in your area. 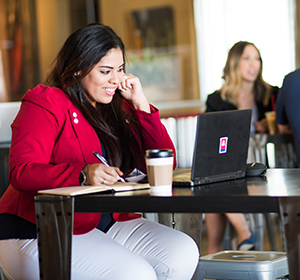 • The University of Arizona Alumni LinkedIn group has more than 30,000 members. Take advantage of this network by joining and being an active member of the group. Join now. • Search LinkedIn for other UA groups based on your college/department or current city. • Use LinkedIn’s alumni tool to find and connect with alumni in particular cities, industries, or companies. Find alumni. Follow the Career Lab on Twitter at @HireACat! We frequently tweet jobs shared by alumni and employers, updates on Career Lab events and articles for professional development.